Monolith Aeroworks L.L.C. is an aerospace engineering design company that focuses on the design and fabrication of prototype air and space vehicles and their systems. We are experts in the rapid prototyping of composite tooling and structures. We continually work to develop the latest techniques, materials and processes that will create new opportunities and competitive advantages for our clients. By obsessively focusing on getting our customers prototypes to the testing phase as quickly as possible, we can help them validate their designs and out perform the competition. If you can dream it, we can help design and build it. Our team has a diverse background of aerospace, marine, automotive, consumer, electrical, defense, legal and software development industries. Check back in with us soon and follow us on social media as we plan to continually update this site and showcase a number of our projects and capabilities. The Monolith Aeroworks team is excited to hear about your project! At the heart of the Monolith Aeroworks prototyping toolbox, there lives a 20 ton 5 Axis CNC, Fanuc controlled, Japanese built, gantry milling robot affectionately named Ms. Avocado. Don’t let her dainty name fool you. Ms. Avocado is big, strong, and she will accurately convert your material of choice into the next world changing design in no time flat. 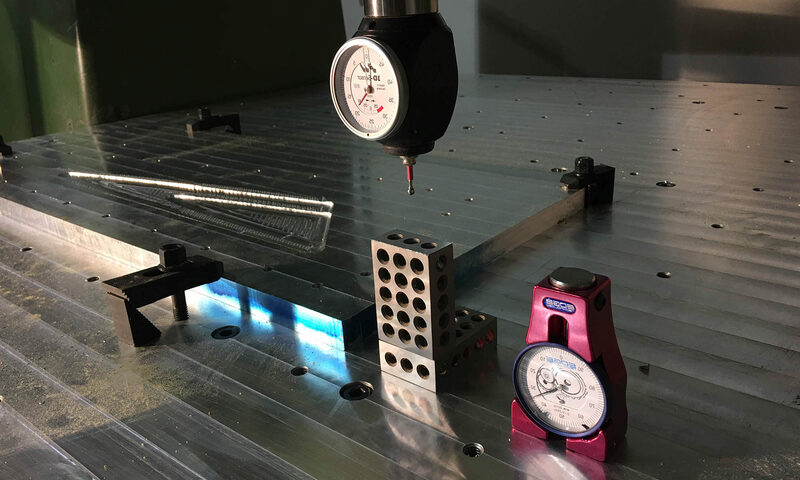 She can repeatedly hold tolerances of less than .005 of an inch, and can be configured to fixture a large variety of materials, part sizes and shapes. Ms. Avocado is equipped with a vacuum fixture table that allows for quick setup times, and correctly supports the lightest weight materials during machining. Contact us today to discuss how we can put Ms. Avocado to work for you! Monolith Aeroworks uses the Solidworks family of engineering software to design, analyze, machine, and tool all of our projects. This loyalty to a single software package streamlines the engineering work flow and prevents costly rework caused by multiple software translations and users. The Monolith Aeroworks team is able to offer the greatest benefit when we are involved in the early design phases of a project. With our expertise involved at the onset of design we can provide your project with the best value, highest quality, and quickest build times possible. How soon would you like to have your parts delivered? Monolith Aeroworks, L.L.C. is dedicated to providing the best value composite design, analysis, manufacturing and tooling. Founded by Cristin and Erik Lassen in Tehachapi, California, the Monolith Aeroworks team currently operates out of a 5,000 sq-ft facility located on the Tehachapi Municipal Airport (KTSP) flight line.